It's nice to be called upon to make something for a party because it allows me to flex my creative muscles and come up with a recipe I ordinarily might not think of without some prompting. My friends had a baby shower this past weekend and asked me to bring a desert. After scouring Pinterest for "baby shower themed cupcakes" and only coming up with gross cupcake recipes with yucky fondant sculptures of babies on top, I decided to create my own recipe. 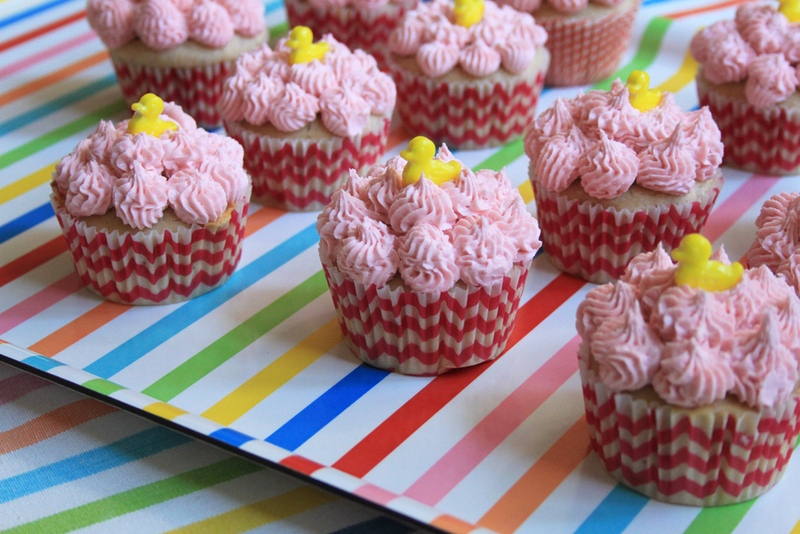 These cute little cupcakes are made with real strawberries in the batter and delicious buttercream frosting. I purchased the ducks at a candy store in my neighborhood, but you can purchase them online here. Preheat oven to 375 degrees. Fill the holes of the cupcake pan with liners and set aside. In a bowl, mix the flour, baking powder and salt together. In a mixer fitted with the paddle attachment, mix the butter and sugar together. Add each egg to the batter one egg at a time. Next, add the vanilla and then add the pureed strawberries. With the mixer on medium-low speed, slowly add the dry ingredients to the batter, scraping down the sides of the bowl until all the ingredients are well combined. Fill each hole in the cupcake pan 3/4 full with batter. Bake for 22 minutes. Remove and let cool on a wire rack. In a mixer fitted with the paddle attachment, mix the butter on low for about 30 seconds. Add the salt and slowly add the powdered sugar about 1/2 cup at a time. When all of the powdered sugar has been incorporated, add the heavy cream. Add more heavy cream if the frosting is too thick and add more powdered sugar if it is too thin. Last, add the strawberry extract and food coloring one drop at a time until the desired color is achieved.